The South Korean government will step up cooperation with Indonesia in the fields of manufacturing, infrastructure and business startups. 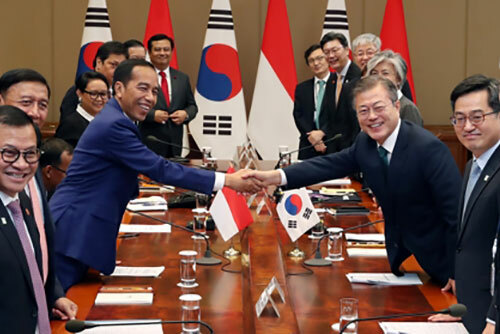 The Ministry of Trade, Industry and Energy says Minister Paik Un-gyu held talks with visiting Indonesian President Joko Widodo on Monday during a forum in Seoul to discuss ways to expand bilateral economic cooperation. During his welcoming remarks at the forum, the minister proposed strengthening bilateral cooperation in a number of areas, including the Fourth Industrial Revolution and free and fair trade. He also called for Jakarta’s cooperation in efforts to conclude negotiations by the end of this year to sign the Regional Comprehensive Economic Partnership trade deal in a bid to better respond to trade protectionist moves. A total of 15 memoranda of understanding (MOU) were signed at the forum between companies and institutions of the two nations. The Indonesian president arrived in Seoul on Sunday for a three-day state visit.